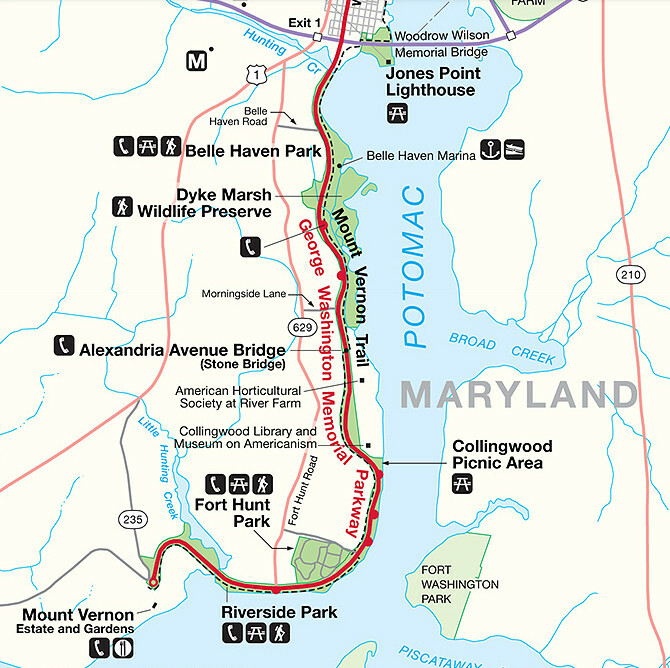 Travel south from Old Town, Alexandria on the George Washington Memorial Parkway towards Mt. Vernon. After crossing the stone bridge at Hunting Creek (unmarked), take your next left at "Belle Haven Park & Marina/Dyke Marsh Wildlife Preserve." The trail out to the marsh is beyond the bike path, on the right, but be sure to scan the cove in front of the picnic area for waterfowl and eagles. The Sunday morning walks meet at 8 a.m. in the south parking lot of the Belle Haven picnic area. Walks are led by experienced birders and all are welcome. You can visit Dyke Marsh Wildlife Preserve without a vehicle by taking a 10-minute bus ride from Huntington Metro Station. Take the Fairfax Connector bus 101, 151 or 152. Go to the Fairfax Connector website for the schedule. Get off the bus at Belle View Boulevard and Wakefield Drive across from the Belle View Shopping Center. Walk east on Belle View Boulevard about three blocks to the George Washington Memorial Parkway. Cross the parkway and walk north about 1/3 of a mile to the Dyke Marsh Wildlife Preserve sign and turn right or east on the entrance road. The pedestrian entrance to the wetland is a dirt road called Haul Road on the right at the sign marked Dyke Marsh Wildlife Habitat.